We are excited and grateful that you have chosen to be a blessing to the kingdom of God! As you sow into Light of Life Ministries, you can be assured that you are sowing your seed into great ground! Click Here to Give Online (via computer) or via text! 1. Simply create a text message from your mobile phone. 2. Type (231) 222-6553 in the "To:" or recipient of the text message. 3. 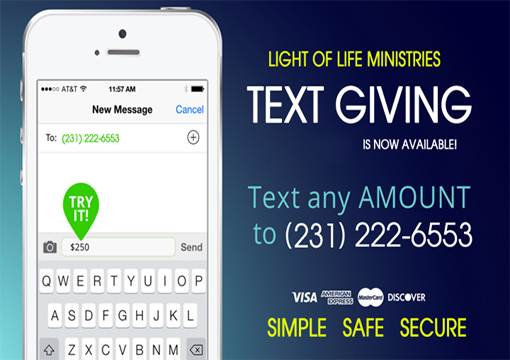 In the "message" area on your phone, type the amount you would like to give (example: $25) and press send. Its that easy! Simple, safe, and secure! No gift is too large or too small! We thank you for your gift!